Carolee Michener wrote an article on the Mill reopening 7/11/1989 in which she said: An open house is planned Saturday at the Old Emlenton Mill, marking the official opening of the renovated facility and the introduction of new shops at the Main street establishment. In addition to Eugene Terwilliger’s hardware store and the canoe rentals which have been part of the Mill for many years, the rest of the facility has been renovated to accommodate the Mill Shops, crafts stores on the main floor of the Mill, and Mill Antiques on the second floor. 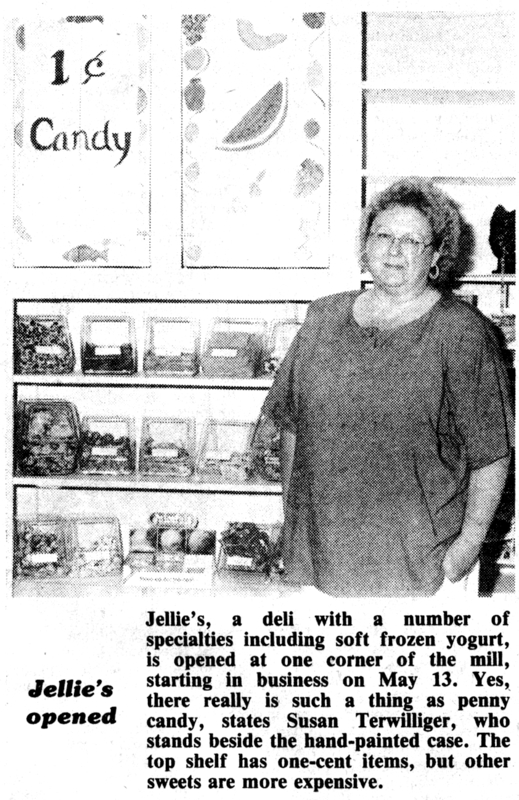 Another feature is Jellie’s which opened on May 13th, and has been enjoying a good deli business, selling subs, a variety of salads, cheese, candy and soft frozen yogurt. Operated by Susan and Daniel Terwilliger the shop is open until 9pm.